A History of Agent Orange More than 20 million gallons of various herbicides were spread over Vietnam, Laos, and Cambodia between 1961 and 1971 during an ongoing military mission. During the Vietnam War years between 1961 and 1971, the U.S. military used tactical defoliants and herbicides to remove vegetation, dense growth, plants, crops, and leaves on trees that provided cover to the Vietnamese and Viet Cong troops. The U.S. Department of Defense developed these herbicides to use in combat operations. The U.S. military dispersed over 20 million gallons of what is known as “rainbow” herbicide combinations, which included various toxins. Agent Orange was the chemical most widely used. Military forces sprayed forests at the border junction of South Vietnam, Laos, and Cambodia; the mangroves on the south peninsula of Vietnam; along the shipping channels near Saigon; and the forests near the demarcation zone. Additionally, it was applied across rice paddies, canals, rivers, and roads. This chemical was named Agent Orange because the 55-gallon drums that stored the toxin had a distinctive orange stripe. Agent Orange contained a deadly chemical called “2,3,7,8-tetrachlorodibenzo-p-dioxin,” also called TCDD or simply “dioxin.” This chemical is a byproduct produced when herbicides are manufactured. Later, it was determined that dioxin causes significant health problems, including psychological and neurological conditions, rashes, and cancer. Dioxin is also associated with type 2 diabetes, nerve disorders, muscular problems, and heart disease. While there are other types of dioxins, the TCDD in Agent Orange is considered the most dangerous. Large numbers of veterans returning home from Vietnam reported various medical conditions. In 1979, a class action lawsuit was filed against seven chemical companies that manufactured the herbicide. The case represented nearly 2.5 million veterans who were stationed overseas and exposed to Agent Orange. It took five years for these individuals to receive an out-of-court compensation settlement of $180 million. But there were challenges to the settlement, including some additional lawsuits filed by approximately 300 veterans. Ultimately, by the time the U.S. Supreme Court confirmed the settlement in 1988, it increased to approximately $240 million. In 1991, President George H.W. Bush signed the Agent Orange Act into law that authorized certain diseases linked to Agent Orange be treated as a result of a veteran’s exposure in Vietnam. 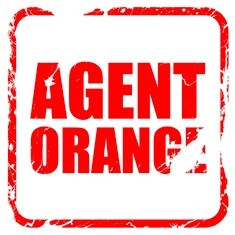 Most veterans know that Agent Orange was toxic, but many don’t realize there's a list of associated diseases that make it easier for them to qualify for benefits if they were exposed. Currently, bladder cancer, hypothyroidism, and hypertension are also under consideration. It’s easier to get disability due to Agent Orange exposure once a medical condition is on the list because the VA “presumes” the illness is a result of a veteran’s exposure to the toxin. He doesn’t have to prove exposure caused his disease. But many vets don’t link their disease with Agent Orange exposure, or they might not know their conditions were added to the list. Understanding the devastating health consequences resulting from toxic contact can result in sizeable disability payments for those who served in Vietnam and later suffered the effects of this deadly chemical. However, even if someone has a medical condition not cited on the Agent Orange list, they should still apply for disability if they believe it was caused by exposure to the chemical. If there's a direct link between an illness and the toxin, they may qualify for a service-connected disability. If you’re a Vietnam vet and believe your medical condition is associated with exposure to Agent Orange, contact Cuddigan Law. Having legal representation and an advocate on your side are valuable assets to your case. Our attorneys know the medical conditions linked to Agent Orange exposure and can help prove that yours is a presumptive disease which qualifies for disability compensation. Call Cuddigan Law today to get help with your VA disability application.